Comments: Stylized, kid friendly, figures of our favorite characters are nothing new. No longer limited to just Star Wars figures, these cute little guys have spread to the Marvel Universe, DC Universe, GI Joe and show no signs of stopping. 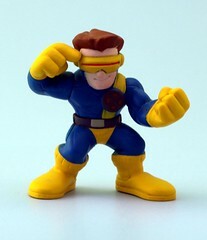 Included in a 2-pack with Magneto, Cyclops was one of the early Superhero Squad releases. However, this really isn’t apparent as the line hasn’t changed much. Cyclops is fairly well sculpted, features nice bright paint apps, and the average level of articulation. The picture really covers everything, if this is the sort of thing you like, then you may want to dig one up.